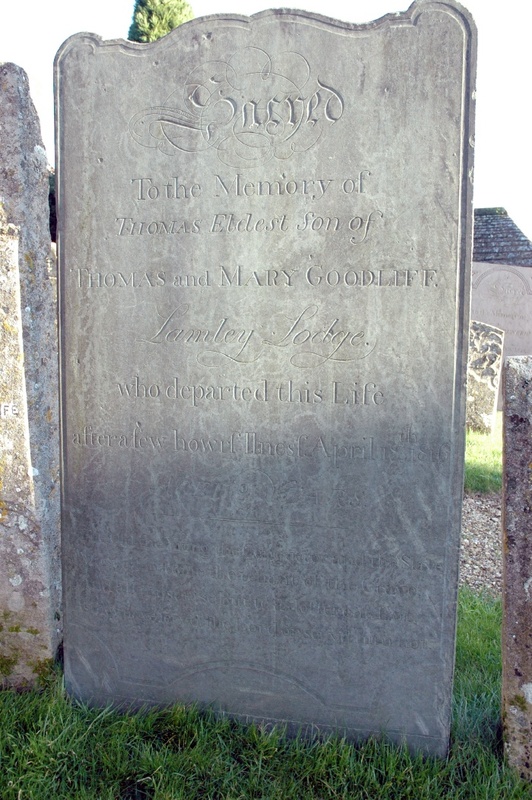 Thomas Goodliffe was born October 8th 1794 in the family home of Lambley Lodge near Belton in the County of Rutland. He was the first son of Thomas and Mary. Thomas died suddenly in 1816. Thomas, my eldest brother, born 1795 was a very active intelligent youth, very useful in business and very devoted to his Mother. On account of my father's feebleness he very early in life took the chief management of the farm, and by his energy and judgement he was successful in his business transactions. In 1816 he had been very laboriously working on the farm land, when he had finished it and the Spring sowing he felt a rest was necessary. He decided to take a holiday at Kings Lynn, at an Aunt's, a sister of our Mother's who had married a Mr. Marshall, one of the largest Gardeners and Nursery-men in the eastern counties. This was in May 1816. He had made preparations for going, when about 9 o'clock of a Tuesday he was seized with violent sickness. Our dear Mother used the common remedies for a bilious attack but could not stay the violent sickness. A messenger was dispatched for the family Doctor, who lived 4 miles away. He was sometime before he could come, and when he came it was too late, so violent had the sickness been that he sank after about 20 hours. I was then about 9 years old and well remember the panic caused by his death in the family, in the village and at Uppingham market, where his business ability and honourable conduct had won respect. He was engaged to be married to a Miss Elizabeth Goodliffe a distant relation, a daughter of one of the large farmers of Belton. Her brother John called at the Lodge just after he had passed away. They were like David and Jonathan, choice friends; his grief as well as his sister's was very intense. I shall never forget the emotion and sympathy manifested at the funeral, almost the entire village turned out to meet the funeral procession as it came along the road from the Lodge to the Church yard. It was a touching scene of sadness, the sudden death of a fine intelligent and genial young man, the eldest, the hope and stay of a feeble father and a devoted mother, who together with 9 brothers and sisters besides other dear friends formed the funeral procession, almost all the villagers falling in. The service in the Church yard was solemn and touching, conducted by the Rector Reverend J. Graham - it was the first time I had heard "Earth to earth dust to dust, ashes to ashes," it appeared so dreadful sounding on the coffin lid. At the grave they sung Steel’s appropriate hymn for the occasion: - "When blooming youth is snatched away, By Death's resistless hand, Our hearts the mournful tribute pay, Which pity must demand." The sad event cast a gloom over the old Lodge family and resulted in a sad change in the management of business affairs, resulting I think in a great change in the future of the position of most of the family. THOMAS and MARY GOODLIFFE Lamley Lodge. after a few howrf Ilnesf April 18th 1816."